Houshiary's tree hangs upside down in the Tate Britain's rotunda and is the first festive work since it's grand renovations. With its roots exposed and covered in gold leaf, Houshiary draws attention to what is usually underground or hidden. When viewed from above it's branches open out in an abstract star-like formation. Houshiary said "I would like us to contemplate that the pine tree is one of the oldest species and recognise the roots are the source of its continued stability, nourishment and longevity. As the roots remain hidden, it is best to seek what is hidden rather than what is apparent. As a Buddhist monk wrote, ‘An old pine tree preaches wisdom’." 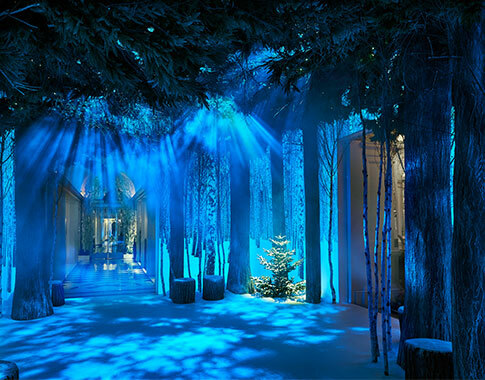 Apple's Jony Ive and Industrial Design Marc Newson have worked with Set Designer Michael Howells to create a magical experience or interpretation of a Christmas tree for this year's display at Claridges. The entrance features light panels with imagery of snow-covered silver birch trees, with real silver birch tress dotted around the space. The lights change colour across the day to represent sunrise, sunset and mimic the passing of time. The designers said "There are few things more pure and beautiful than nature, so that was our starting point, layering various iterations of organic forms with technology. Our aim was to create an all-enveloping magical experience that celebrates our enormous respect for tradition while recognising our excitement about the future and things to come." 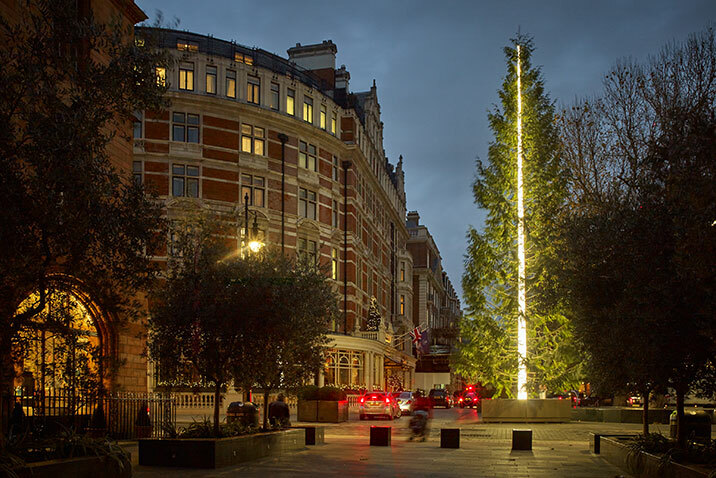 This year the Connaught Hotel has employed renowned British artist Antony Gormley to design its Christmas tree. 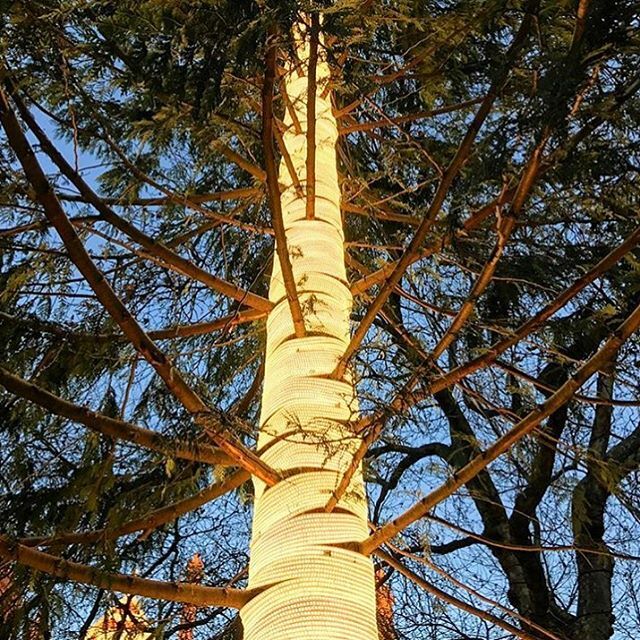 He has placed a magnificent Western Red Cedar tree, sourced from Shropshire, on Carlos Place. Its trunk has been transformed with light which enables it to glow in the distance. Gormley said "I thought that rather than decorating the outside of the Christmas tree it would be fun to light its core, the trunk, transforming it into a radiant centre against which the branches would become illuminated and silhouetted. I want the tree to celebrate life and all its myriad forms. At this, the darkest time of the year and at a moment of global dysfunction, I hope this magnificent tree conveys a feeling of continuance and vitality". The tree at King's Cross this year has been designed by artist Alex Chinneck and is a giant tree enveloped in a seven metre 'cube of ice'. The 'ice' is made from resin, carefully carved to replicate the features of ice while a surrounding clear wax puddle gives the impression of melting ice around it. Chinneck said "King's Cross is known for its quirky installation, and I wanted to build on this. Everything we produce is unique to us, and we want the people who are experiencing it to have the same feeling." The tree at St Katherines Dock is London's only floating tree. It boasts an impressive 14,000 lights which sparkle on the hour, every hour. It's moored in the West Basin and was put together with The Christmas Decorators - the UK's only specialist Christmas decorting company. For this year's tree at the Victoria and Albert Museum, StudioXAG wanted to evoke the spirit of a traditional Victorian Christmas, taking the V&A back to its Victorian origins. They have dressed their tree with handmade decorations while the metal tree takes inspiration from the Museum's iron roof framework.